Here at UCLA, we've been given a lab space that we use as our center of operations. The IEEE Lab is an open space for all general members to come in, work on their projects, meet new people, talk to present officers, or even just to chill and eat lunch. 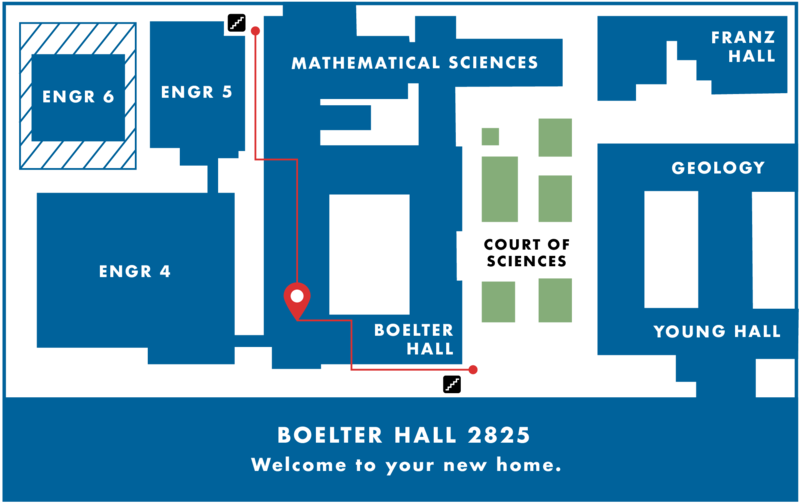 Our lab is located at Boelter 2825. Come find us! The easiest way to find it is to go to the west side of 2nd floor Boelter (the lowest balcony). We are the second door down from the bridge to E-IV. The IEEE logo is posted on our door for easy locating. Need to know when the lab’s open? Looking for your project leads? Need help on your homework? Check out the table below to find out when your favorite officers will be in the lab. We've stocked up on various tools that members can use in our labs. Some of the heavier tools we have include: soldering stations, oscilloscops, power supplies, 3D printers, a drill press, DMM's, a big whiteboard, etc. Mostly popular tools used to complete hardware related projects. We also have smaller, general tools such as: scissors, wire cutters, pliers, rulers, screwdrivers, etc. Slack is a team communication application, and is one of our primary means of communication within our organization. Our Slack workspace is free to join to all general members at https://uclaieee.slack.com/. Within our Slack workspace, you can directly message officers, communicate with fellow project members, and ask if the lab is open.